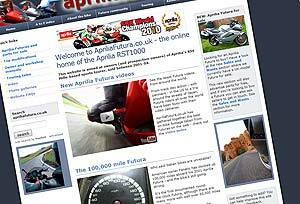 The Aprilia Futura website has been completely rebuilt and much of the content has been edited. The site has a new, more modern design which also displays as well on mobile screens as it does on desktop PCs. It’s also optimised to load fast over slower mobile connections. The old site was built in the Joomla CMS, which was difficult to use and get the site structure I needed. There were a lot of workarounds, too. It didn’t help that the Joomla site was hacked at the beginning of 2013. It was either delete the site or rebuild it completely. This version of the site (the third since 2008) is built in WordPress, which has allowed a better structure, a better search, better security and a mobile responsive design. Hopefully we won’t have to move it again! While there hasn’t been time to do everything in the site, we’ve got rid of out of date info and updated what we could, though we’d like to have time to do more. Everything that might be useful has been brought across to this new website. The old site is currently (June 2014) live but we will be redirecting its pages in the next few weeks. If you have any pages on the old site bookmarked, you may need to update them to point at this new site. I never liked the Google ads on the site, but had to do something to try and cover the site’s running costs. Ads only raised pennies, but also they would have made this site harder to use on mobile especially. So the ads have been dropped in the hope that enough of you will donate to help cover the costs and maybe contribute towards improvements. It costs over £200 per year to keep this site up and running through hosting and maintenance and since launch in 2008 I have covered this cost. If you have found this site useful in any way please consider making a donation via PayPal. It’s quick, easy and secure.